The Superstition Mountain Republican Club will be holding its monthly meeting May 12th in the back room of the Mirage Sports Grill in Apache Junction. It is located at the far east end of the Ace Hardware complex. The event will begin at 6:30 p.m. until 8 p.m. You are invited to come early to purchase a meal and enjoy fellowship with current and future members. Representative Kelly Townsend and Representative Doug Coleman will be featured with focus on what took place during the past legislative session including the budget. This will be an audience participation event with questions coming from the audience.. This will not be a campaign event. The Superstition Mountain Republican Club President Gil Cancio invites all those in the area wishing to know more about what our officials are thinking in terms of handling the multitude of issues facing our state today to attend this hour and half long event. As response times will be limited, the format should provide plenty of time for a wide array of questions.We would like to extend an invitation to anyone who is a registered republican to come and join the organization. The annual cost is $15.00 per individual and $20.00 per couple. We are always looking for fresh ideas and lively conversations. If you have any further questions you can call Gil Cancio at 480-435-7161 or Jeff Struble at 480-694-5100. We look forward to seeing everyone May 12th at the Mirage Sports Bar. PHOENIX, Ariz. (March 7. 2016) – Arizona media apparently has little interest in informing Arizonans about what is going on in their state legislature if it doesn’t fit its agenda. 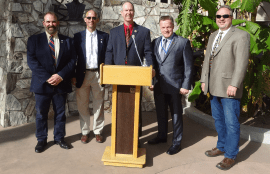 Last week, the Arizona Tenth Amendment Center hosted a press conference in support of nine measures making their way through the state House and Senate that would serve to limit federal power and reestablish state control. Several state legislators showed up, but zero members of the media bothered to take advantage of an opportunity to learn about an important movement currently gathering momentum in the Arizona State Legislature. The press conference highlighted nine bills pending in the Arizona Legislature that would serve to limit federal power in some way. Legislation addressing constitutional tender, the right to keep and bear arms, NDAA indefinite detention, presidential executive orders and asset forfeiture law reform were among those featured. These aren’t bills simply languishing in committees. Legislation to prohibit state cooperation with federal indefinite detention without due process, to define gold and silver as legal tender and to bar state cooperation with the enforcement of future federal gun control have all passed one chamber of the legislature. But this apparently doesn’t count as news in the Grand Canyon State, and major media players don’t deem it an important responsibility to inform Arizonans about these initiatives. The Arizona TAC sent out some 50 invitations to members of the media. Prominent Arizona activist Joel Alcott said it was no coincidence that the press ignored the event. He said that because these bills are among the most controversial before the legislature this session, it was a deliberate move to avoid lending them any additional credibility. Since Arizona voters approved the measure, efforts to put it into action have stepped up with legislators introducing numerous bills. Journalists love to talk about their responsibility to the people and opine about their integral role in democratic self-government. They sometimes even refer to themselves as the “Fourth Estate.” But in practice, it seems like nothing more than pious talk. In the real world, far too many media outlets have become shills for the status quo and left-leaning establishment politics. That may sound unfair, but the crickets at the Arizona TAC presser testifies to this truth.